Step by step instructions on this github repo. No Coding, Python or R required. 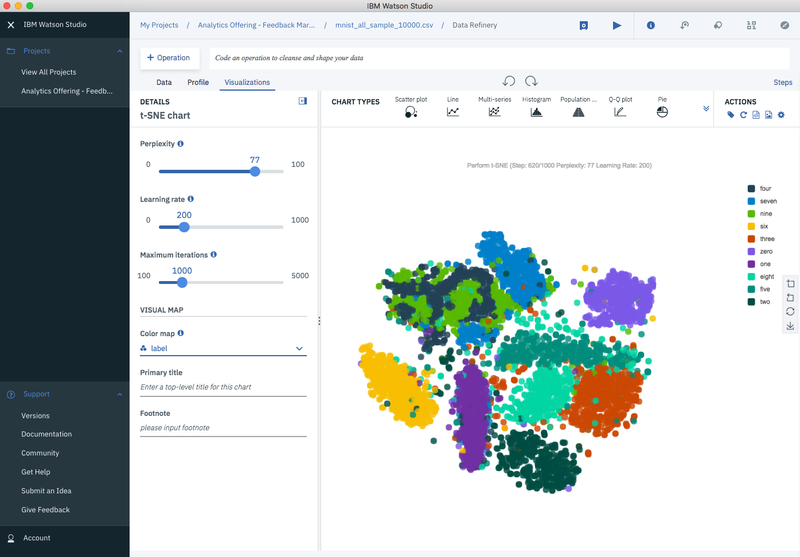 Just plug your high-dimensional data and visualize it with the Data Refinery Tool in Watson Studio. Don’t get me wrong, I love coding in Python and R but when it comes to visualizing data fast, I just use Data Refinery. First things first. In this blog I refer to high-dimensional data in the number of features of a data set and not necessarily in the number of observations. Images are formed of a large number of pixels, which can be projected to two dimensions. But why project to two dimensions? Grouping together images that represent the same object can help us classify images. To verify visually how good our grouping technique is, we need to project first to two or three dimensions. I will introduce an example where images of handwritten digits are projected from 784 dimensions to 2 for visualization purposes. Perplexity — An educated guess about each point’s number of close neighbors. Helps to balance the local and global aspects of your data. Learning rate — By specifying how much to change the weights with each iteration, this value affects the speed of learning. Maximum Iterations — A cap on the number of iterations to perform. In this example, I used the MNIST database of handwritten digits, which you can download here. The database contains thousands of images of digits from 0 to 9, which researchers use to test their clustering and classification algorithms. The full data set consists on 60,000 images for training and 10,000 for testing, but to keep things simple for this example, I sample about 1,000 images per digit from the database, so a total of 10,000 images. Each row of the sample data set is a vectorized version of the original image (size 28 x 28 = 784) and a label for each image (zero, one, two, three, …, nine). Therefore, the dimension of the data set is 10,000 (images) by 785 (784 pixels plus a label). Before writing this blog, I had never had the chance to learn about t-SNE. Every time that I needed to reduce the dimension of a feature space I would use PCA. I knew that PCA was great for reducing the dimension of data sets which columns are linearly correlated. Now I know that t-SNE is a viable alternative when the relationship of your columns is non-linear. 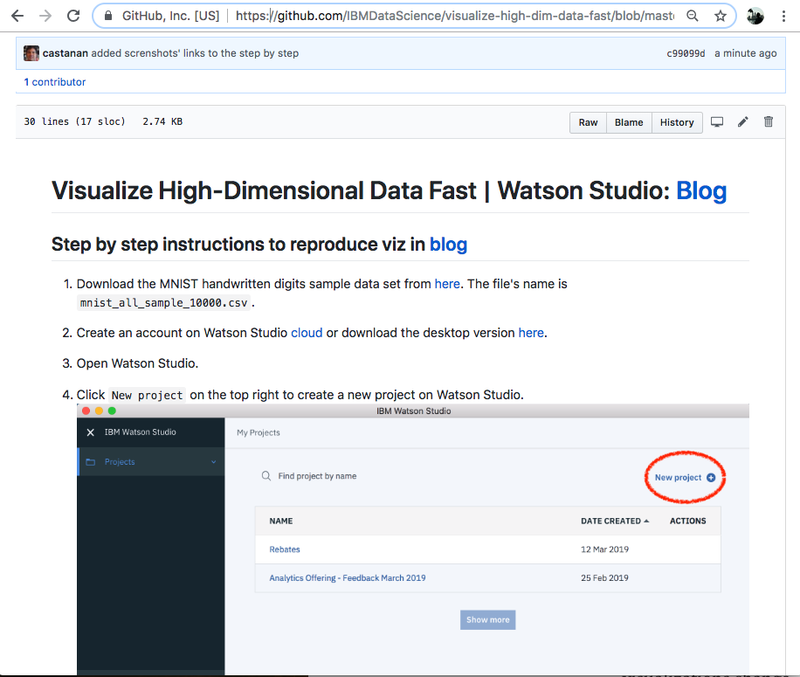 Find more about Watson Studio Desktop here or the Data Refinery here.